An aerial look at the Marx Brothers site today. A project five years in the making gained widespread attention last month when it was portrayed as the latest chapter in the Bill de Blasio-Andrew Cuomo feud. Neither the mayor nor the governor, however, warrant the attention. 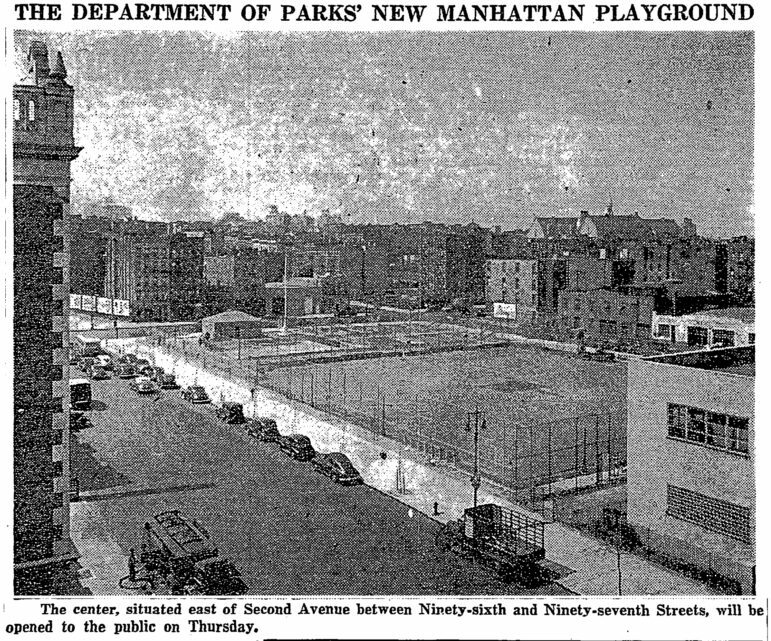 They’re minor characters in a story that hinges on a complicated issue: Is the Marx Brothers Playground on 2nd Avenue between East 96th and 97th Streets a park or a playground? On October 23, Cuomo and the State Legislature agreed to find out. In a memorandum, the Governor ordered Rose Harvey, Commissioner of the State Department of Parks, Recreation, and Historic Preservation to “investigate all of the property’s historical records, uses, and any other factor relevant to the land’s designation.” Consequently, before the City can commandeer the area for construction, it must wait for Harvey’s assessment. Marx Brothers Playground—named after legendary comics Chico, Groucho, and Harpo who were raised at nearby 179 East 93rd Street—shares its block with the School of Cooperative Technical Education (COOP Tech). Dubbed a “jointly operated playground” or JOP, it’s managed by both the Department of Education (DOE) and the Department of Parks and Recreation (DPR). The DOE runs the playground during the school day—typically 8 AM to 4 PM—while the DPR provides permitted access to the grounds when school is not in session. Currently, there are over 250 JOPs across the city. Even though the Metropolitan Transit Authority (MTA) has been allowed to use 23,000 of the 64,000 square foot playground to build Phase One of the Second Avenue Subway the past decade, the DOE and DPR will eventually get it back. However, the JOP is a part of a larger scheme to put up new housing and schools on the block. In September 2013, the Educational Construction Fund (ECF) selected AvalonBay Communities, Inc. to redevelop the site. The firm’s proposal survived the Uniform Land Use Review Process (ULURP) and secured the City Council’s approval in August 2017. Meanwhile, the Marx Brothers Playground will be shifted to the center of the block. The project will cost approximately $950 million, with AvalonBay expected to spend $450 million on the residential and retail components. The ECF, in its capacity as a public benefit corporation that helps finance school construction, will issue bonds to cover the rest: $250-$300 million for the schools, $192 million for the tower’s affordable housing stock, and $8 million to move the playground. The developer will receive a 99-year ground lease on the parcel fronting Second Avenue that was once the playground’s and the ECF will service its bonds with revenue from the lease. Of the 300 affordable apartments, 100 will be set aside for households making less than $34,360 for a family of three (40 percent of area median income, or AMI), while the other 200 will go to households earning from $51,540 to $85,900 for a family of three (60 to 100 percent of AMI). During the project’s ULURP stage, local officials tried to get AvalonBay to tweak some of those numbers but failed. “The Area Median Income (AMI) does not go low enough for 37 perfect of residents who make $23,000 or less. We believe that the AMI and the affordability can go lower,” Manhattan Borough President Gail A. Brewer said at a meeting of the City Planning Commission (CPC) in May 2017. In a letter addressed to the CPC In March 2017, Chair of East Harlem’s Community Board 11 Diane Collier wrote that the venture needed to “include more affordable housing units, with 50% of the units to be permanently affordable.” In 2016, the East Harlem Neighborhood Plan set an even higher and broader goal, urging that public sites be redeveloped with 100 percent income-targeted housing. To realize the scope of its blueprint, AvalonBay obtained City Council approval for changes to the site’s zoning, waivers for parking and open space requirements, and permission to build a higher tower in exchange for affordable housing—a newer tactic that required creating a Mandatory Inclusionary Housing (MIH) zone. The Marx Brothers Playground, however, presented a more complicated issue. Back in 2004, when the MTA was authorized to stage its Second Avenue Subway necessities on a piece of the playground, the state law that temporarily permitted the takeover labelled the Marx Brothers as “park lands.” Now known as Chapter 543 of the State Laws of 2004, the bill directed the MTA to “restore the surface of the lands” when it was finished with its project and provide “replacement trees to be determined by the Parks Department” so that the “lands shall continue to be used for park purposes.” As a piece of protected parkland, then, the playground was exempt from all zoning laws and unable to generate useable floor area. A developer couldn’t build anything there. 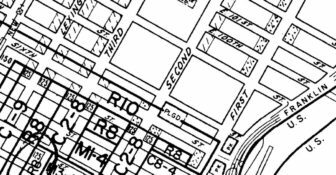 Now, as a regular lot, it was immediately subject to the laws of whatever zoning district had jurisdiction. Moreover, the changes that AvalonBay procured through ULURP also went into effect. The former playground now produced floor area. The ECF could officially take possession of the Marx Brothers-COOP Tech site and transfer it to the developer. Demolition and construction teams could finally emerge. But after news broke of the Marx Brothers’ plan, stakeholders in the community like Carnegie Hill Neighbors and watchdogs like Geoffrey Croft at NYC Park Advocates got involved. In July, Carnegie Hill Neighbors, the non-profit group operating a few blocks west, appealed to Governor Cuomo to reverse the legislature’s decision. More groups followed its lead. In August, the Municipal Art Society, New Yorkers for Parks, and the Trust for Public Land sent off similar petitions. And, in the most public display of all, New York City mayoral candidate Sal Albanese and public advocate hopeful David Eisenbach staged a protest outside the playground on August 17th. Moreover, spaces across the city are signed as parks but, on second glimpse, are comprised solely of playground-like equipment. Take Holcombe Rucker Park in Harlem, for instance, where its grounds contain swings, slides, a baseball diamond, and its renowned basketball court. On the other hand, some spaces are dubbed as playgrounds despite being located within parks—most notably the Billy Johnson Playground near East 67th Street inside Central Park. So how can you tell which is which? Aren’t parks and playgrounds just the same thing? It’s not just semantics. Depending on one’s take, these terms suggest—if not dictate—how the parcel of land is to be treated. Historically speaking, the City has often claimed playgrounds as part of its park system. In doing so, it may have given them an “implied parkland” status. Under public trust doctrine, all that is necessary for a parcel of land to establish itself as a park is for it to have been “continuously used as a public park.” Moreover, as both the City has dedicated playgrounds for public use and its residents have accepted them as such, the notion of playgrounds as parks has solidified. You can see the idea at work in recent administrations. Although it sought the playground’s alienation earlier this year, the de Blasio Administration has contended internally that the Marx Brothers “is not and has never been parkland.” Moreover, it has argued that Chapter 543 of the State Laws of 2004 was wrong in declaring it such. The 1983 map in question, however, resembles the one from 1961, except for a bold “TA” which delineates the Metropolitan Transit Authority’s (MTA) future staging area for the Second Avenue Subway line. The most recent map from April 2017 also echoes the one from 57 years ago. 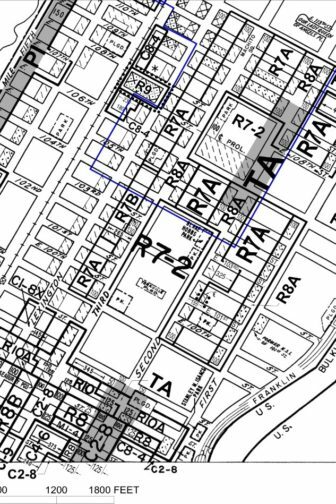 The city's current zoning map of the area. Nonetheless, because Chapter 543 characterized the playground as “park lands,” Maldonado noted that the ECF had to be “prudent” and secure the Marx Brothers’ alienation. But, there could be a wrinkle. The last paragraph of the State’s alienation bill proclaimed that if the City “received funding or support or assistance from the federal government for the purchase, maintenance or improvement of the [playground],” it could not alienate the Marx Brothers property until it “complies with any federal requirements pertaining to the alienation or conversion of such land.” If the City accepted money then from the Land and Water Conservation Fund Act of 1965 or the Urban Park and Recreation Recovery Act of 1978, for example, the U.S. Secretary of the Interior would supersede the State Legislature’s jurisdiction over the alienation process and be able to decide the Marx Brothers’ fate. 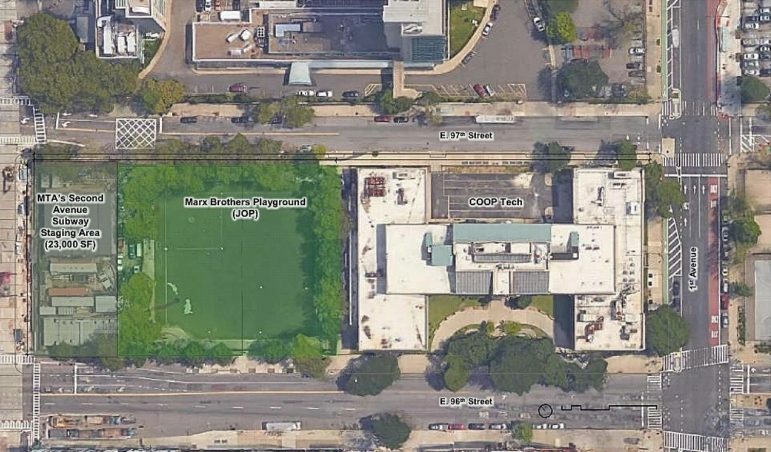 The Board of Education—precursor to today’s Department of Education (DOE)—spent a swath of money developing the Marx Brothers Playground-COOP Tech site. From 1941 to 1942, it deployed $430,000 to purchase the property’s deed from its former landlord, $490,000 for a new building permit, $2,885,000 to erect the Machine and Metal Trades Vocational High School (COOP Tech’s predecessor), $966,300 to provide the school with machinery and, lastly, as the Times reported then, $90,000 to stock it with “machine tools classified as vital to war industries.” That’s $4.9 million, or around $76.3 million today adjusting for inflation. Although an additional $44 million was dispersed on more improvements during the 1990s, it’s unclear what amount—if any—went toward the playground. From 1947 to 1947, however, the Department of Parks and Recreation (DPR) did spend at least $10,000 to assemble the Marx Brothers’ comfort station, wading pool, softball diamond, children’s play area, and roller skating-ice skating platform. Moreover, according to the DPR’s website, the Department of Housing, Preservation, and Development (HPD) just spent $900,000 there installing new synthetic turf, creating animal artwork, and refurbishing the landscape in 2001. It’s unclear if any of those funds can be traced back to the feds. The federal issue aside, what will Commissioner Harvey’s conclusion mean? The Marx Brothers Playground—whether originally parkland or playground—is now alienated and poised to supply its development rights to AvalonBay. Because of the de Blasio administration’s current position on the Marx Brothers, it is conceivable that other playgrounds, JOPs, or even parks themselves could have the potential to be alienated for their development rights. The risk is not new: The Bloomberg administration often worked parkland into development projects, from Yankee Stadium to Brooklyn Bridge Park to Flushing Meadows. Cuomo’s October 23rd memorandum merely places the inevitable on hold as Harvey’s future findings are not imbued with any force of law. She wasn’t even given a timetable to return them. Perhaps the pause will foster greater public awareness. Or maybe Cuomo’s missive will be heard as a wake-up call to officials about the overall role of parks—and playgrounds—in an increasingly dense city. A New York Times photo from the opening of the new playground, or park. The aloenation of parkland/playgrounds is disgraceful, given the research and evidence showing how important parks are to the health and well being of urban dwellers. EVERYTHING in modern Manhattan has a “murky” origin. Why is a “gentlemen’s agreement” for a public park suddenly in question? If that’s the case, then let’s demand the restoration of Seneca Village in Central Park! If the park is allowed to be alienated and used to benefit development, an awful precedent will be set and parkland across the city could be threatened. Public spaces such as Marx Playground provide great value to promoting clean air, free access to recreation, stormwater retention, and sanity in an ever increasing crowded city. When is it a park, when is it a playground? Semantics aside, public spaces need to be strictly protected from developers who minimize the importance of free recreational space for people to enjoy their neighborhood. If our neighborhoods don’t include space for play and recreation our city will be bleak place indeed. And…I’d like to add my vote for returning Seneca Village to the ancestors of the families who were evicted. Reparations?